Boris Johnson was accused of lying today after he denied saying that 80 million Turks could flood into Britain during the Brexit referendum campaign. He was quizzed about controversial adverts run by the Vote Leave campaign he fronted warning the UK could end up with open borders with Turkey if it stayed in the EU. 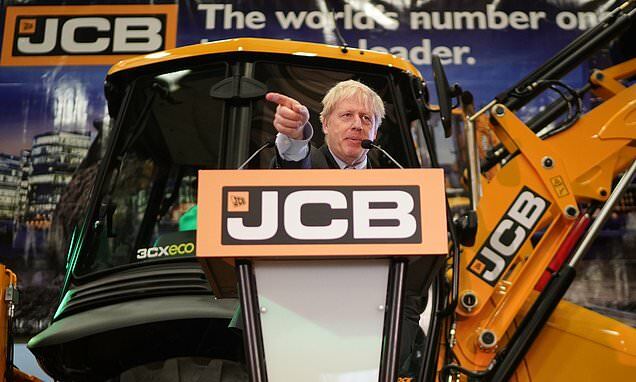 Taking questions after a Brexit speech at a JCB factory in Staffordshire today, Mr Johnson denied making any claims about turkey in the referendum campaign. He said he had always made clear that immigration 'can be a wonderful thing', so long as it is 'controlled'. But a search of the internet revealed that he had warned of the risk of sky-high immigration from Turkey if the UK stayed in the Brussels bloc. In an interview with The Sunday Times in April 2016: 'I am very pro-Turkish but what I certainly can't imagine is a situation in which 77 million of my fellow Turks and those of Turkish origin can come here without any checks at all. In a joint letter to David Cameron, Mr Johnson and Michael Gove demanded he rule out Turkey ever joining the EU. The letter said: 'It is Government policy that Turkey should join the European Union and ''to pave the road from Ankara to Brussels''.